I’m not sure I’ve mentioned it here on my blog, but I love to crochet. It’s not something I always find time to do, what with working full time, having three kids (well, six if you count my boyfriend’s kids), and writing. But every time I pick it up again, I realize how much I enjoy it. I just started a new project the other day and there’s always that point where you get about four or five rows in and you can start to see the pattern come to life. I think it falls into my creative space. I just love creating things and crochet is something I find I am relatively good at, although I haven’t tried anything super challenging. There is a point, though, where it seems nothing works. I found myself last weekend reading that pattern, crocheting, undoing it and starting over. I think I did that about three times before I realized it wasn’t the yarn; it wasn’t the pattern; it was actually me. There are times, though, that I still struggle through, hoping for a different result and I end up getting frustrated and upset, rather than just letting go. If I think about it, it’s almost like taking a breathe when you are angry to stop the flow of angry energy. It’s the same thing with crocheting or writing for that matter. Sometimes, you just need to find some stillness within before you can begin again. I ended up undoing the whole project (I was only about four rows in, thank goodness) and putting it away for the night. The next day when I picked it up, everything flowed much better and I realized I had it right all along the night before, I just didn’t realize it. I couldn’t see it. All I could see was how wrong it was and I was completely frustrated with it and my ability to crochet, thinking that maybe I had picked up a pattern that was just too difficult for me. I’ve found that my writing is the same way. There are times that it just flows out of me and I’m not sure where it comes from and other times it’s like fighting for every word. I’m not saying you stop trying. I’m just saying there is some benefit to walking away, taking a breath, maybe finding some inner stillness and then picking it back up again. I have found, though, that the best thing to do is to walk away and come back to something new. I follow a lot of challenges and rather than beating my head against a genre that I’m just not comfortable with or writing for a challenge that doesn’t interest me, I wait for the next one. There have been times over the last year that I struggled on and posted something, but not many of them have been my best work. I’ve surprised myself a few times, though, so sometimes it can be worth it to struggle on. But maybe even just finding the stillness for a few moments will bring a better outcome. Or maybe you will get to the end not quite as frustrated. 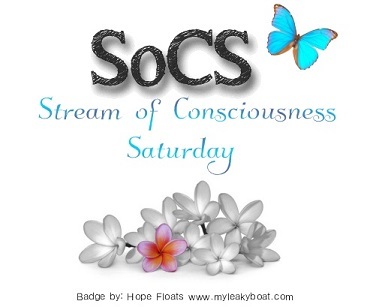 This rambling post is brought to you by Stream of Consciousness Saturday hosted by Linda G. Hill. Our word prompt today was “still.” Feel free to click the link and join in or read other amazing posts. With me it is not the stillness I seek but the silliness. I need little silly whimsy to calm my seriousness. Mary (my wife) has knitted and crocheted since we’ve been married (38 years in January) and still has days like that. I know how frustrating it is for her. There are some days you’re better off watching TV or reading. Hi Helen, I agree with you that at times it is beneficial to walk away and go smell the roses then come back and often you see a way forward that wasn’t there before…..my mother was a crochet person and left behind a lot of pieces she made…. Yes when we were kids my mum made us one each and we used it every where until they wore out…. I can so relate to you with crocheting. When i did my first tablecloth I really had a hard time, but it turned out beautiful. Yes you are a beautiful crocheter. Thoroughly enjoyed your post. Love you sweet girl!! The former is way better. Lol.